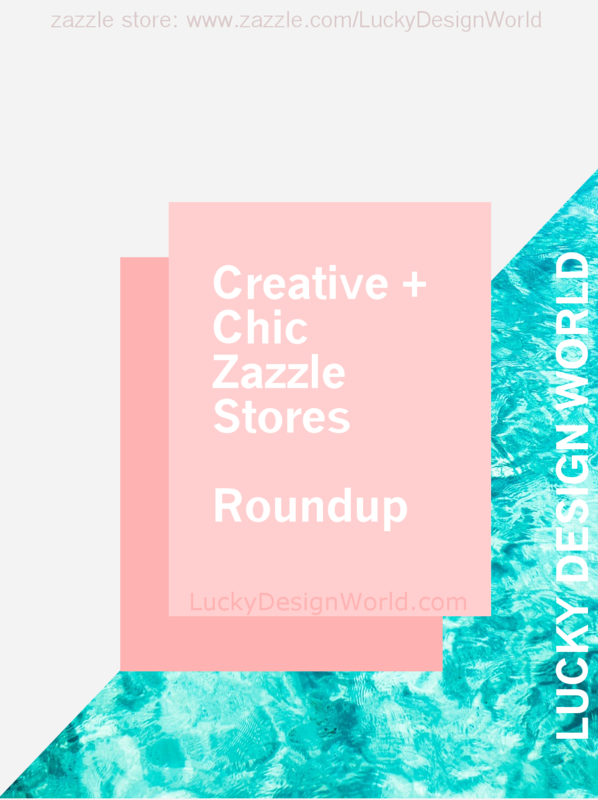 So here’s this week’s fantastic Zazzle stores! The Zazzle Market Place is marvelous! There is a wide variety of products and a gigantic variety of designers out there creating products you can customize! I’ve spent plenty of time researching the market place and along the way, I’ve found out there are some new store’s that have charming products! A sophisticated boutique with all designs about cats! Beautiful artworks – all original – that have bold colors and each of the cats eyes are strong and have a majestic quality to them. It’s remarkable! Here is one example, a beautiful poster of Siamese cats called: Legend of the Siamese Cat Art . Everything about this poster is well done: perspective, placement and tone. A rich evergreen hue borders the painting. The blue tones and light green paint work along with the square tile pattern in a border with serves as a nice contrast to highlight the pair of Siamese Cats. Each one of these cats are truly unique. Even their noses are different! The standing cat and a nice decorative pattern of stripes and dots. The other one, resting has a deep thoughtful blue for it’s fur. How can you forget those eyes? They have a regal quality to them for sure. The background is a contrasting tone of orange red blend but -it works – because it is warm and inviting and it provides the perfect compliment to highlight the Siamese duo. Wouldn’t this poster look great framed and displayed in a dining room? I would highly recommend this design for anyone who loves cats – in particular cats from the Orient. Next, design is a fun tote bag (more styles are available) called “Lovely Ginger Cat with Bindi and Pink Flowers” Tote bag. These colors are perfect for summer! Take your books to the beach or use it instead of a purse. Or it could work as a gift too! What is so great about this design is the fact that the colors really pop! The magenta accentuates and compliments the ginger cat. There is a border that frames the art piece in a green color and a pattern of squares and circles. The ginger cat has a nice blend of orange tones, ranging from yellow to deeper reddish oranges. It’s the focal point of the artwork. The rainbow pattern on the tail is so cute! The background is a sky blue color reminiscent of sunny and warm days. Around the cat are graceful Art-Deco pink Lilies. Even though, it’s mentioned they are poison to cats, in the painting it seems to be protecting the cat. Another fun fact from the artwork’s description, the cat has a Bindi, which is a bringer of good luck! Aren’t kittens so playful and inquisitive? They are also cute as a button and this blue kitten is just adorable. It looks into the goldfish bowl. What will happen next? Goldfish are a favorite of mine, so to me in this piece it doesn’t look as if it’s in real harm, the cat is just admiring it! The blues in this artwork piece have a range from a spectacular indigo to a light turquoise blue. The stripes are a unique touch as if it is a rainbow of blue tones pattern. This product was chosen because it would make the perfect gift for someone you know that like kittens and cats (and coffee). The design’s description also mentions that the design is framed in an idyllic artist’s statement – friends forever and the design represents a peaceful and serene moment between good friends. The design is on both sides of the mug. There really is wide selection of products and cat designs. 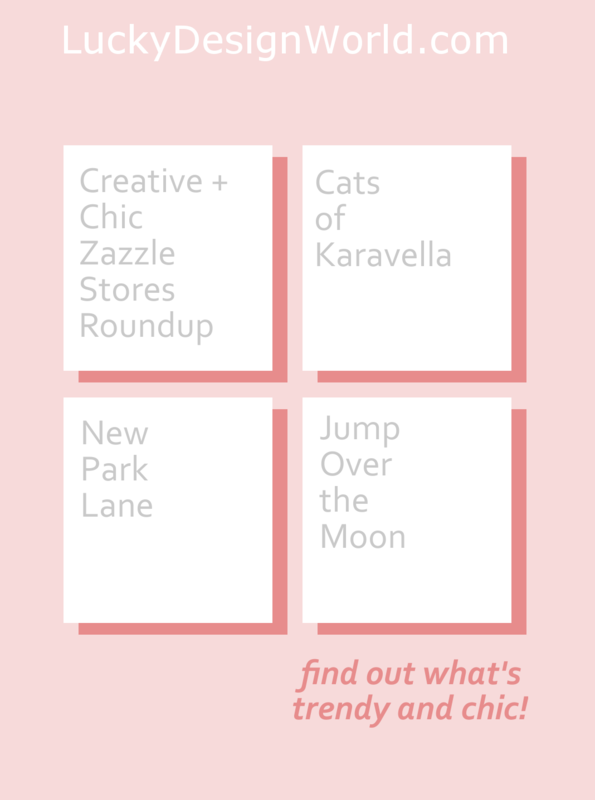 Visit Cats_Of_Karavella and find out more! New Park Lane is a Zazzle boutique filled with pink! What a lovely color! But this is a store that has more too – light blues, golds, sparkles and patterns! Based in Holland, the store has an eclectic contemporary mix of designs and products. Here is a sample that I recommend. Even though it’s a long way before the Christmas and Holiday Season starts again, it’s just too cute and needs a mention! I’ll start with Polar Bear – Cold Outside – Fun Christmas Magnet . It’s a cartoon design that would make a perfect gift for the holidays! It has a cute little smile, rosy cheeks and a warm scarf. The gradient grey to white background feels like its cold but the use of the rose color warms up the design quite nicely. Also note that there are some backgrounds on some of the products in the corresponding collection are pink! Pick which one you like! It’s just like a teddy bear for Christmas! The typography is a nice handwritten type font that compliments the design’s modern and chic look. Use this magnet as a cute accent that hangs up some photos from the Holidays or ski trips! There are more product options using this design in the collection called ” Winter: Polar Bear“. It has Christmas cards , snow globes, stickers and more! Next is a glamorous design for a fashionista! It’s trendy – pink and shimmering with sparking lights. This happy design is for anyone who likes bokeh (or known as originally as : bokashi (暈かし)) photography and art. This is a design you can customize through Zazzle’s editing features. You can add your name, monogram, or even a cool quote that inspires you! This could be a gift that dazzles! Another chic choice from New Park Lane’s selection is a fun quote on a mug. It would be great to go with your morning coffee (or tea). When I read it, I automatically thing of the Wham tune! A cheery reminder of a cheery song. This is a must for a gift- or even gift for yourself! The typography is a modern streamlined look in a rosy coral hue. It’s original in it’s use of “go go”. Both sides have the design. This next new store has a lot of cute designs for holidays and everyday! Another item to mention, this store has lots of pastel tones which is great. Jump Over the Moon has cartoon designs for anyone who like floral themes, gardening, farming, homesteading or just anything adorable! Plus, there is a nice selection of products to choose from ranging from cards to home decor! Did I mention there’s pink too? This next design is a cool combination of a cute hedgehog silhouette with pink daisies filling it. Each one of those daisies remind me of a sunny day! The hedgehog looks as if it’s smiling! Do you see it too? In any case, this is a bright and happy design! Next design is a cool blue luggage tag. This design has a nice use of modern chevron pattern (something easy to spot when you need to find your luggage after a flight) in a gradation of blues, a turquoise pairing with a navy. The use of grey is very trendy and chic. The monogram in is a teal tone and in sans-serif typography font. Customize it for yourself or for a gift recipient. Wouldn’t this brighten up a regular suitcase? Spot your luggage quicker and fashionably! You can find more in the collection, including a matching passport holder! There are more choices for this design, please take a look! The next product to mention is this brightly pastel look of carrot and stripe pattern soup mug! The carrots vary to light orange another is a darker orange. It reminds me of the variety of heritage carrots you see at a farmer’s market. Anyone who is a gardener, cook, vegetarian, or a vegan would like this design. Even someone who likes bunnies would appreciate a gift like this. Wouldn’t it make a great housewarming gift? Perhaps a set of two or four? What do you think about these designs and products? It’s a preview of the abundance of creativity and product selection available in these stores. Visit them today! 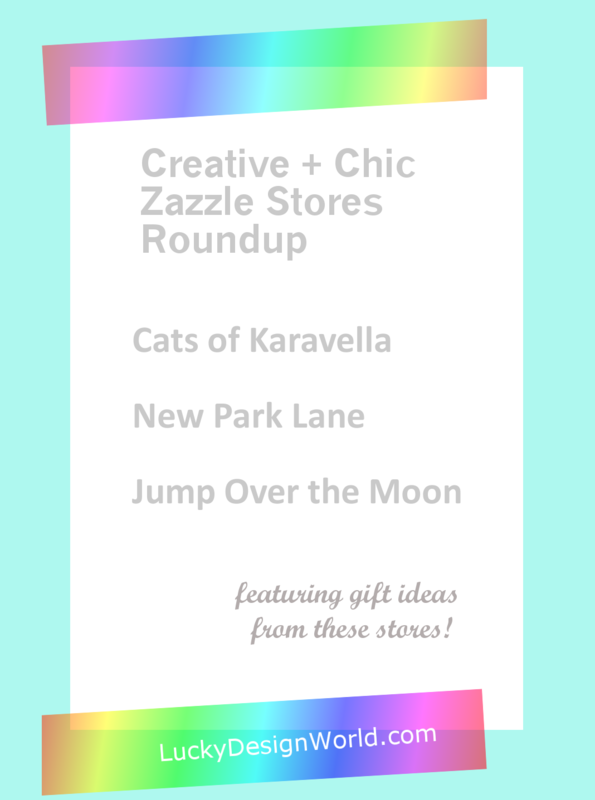 Thanks for reading this first edition of Creative and Chic Zazzle Stores Roundup. Here are some related posts! This is my longest article to date being over 1,800+ words! and you know what? It’s been really fun! Have thought about blogging yourself? If yes, then I’d have to recommend using Siteground because they provide safety along with speed. With brilliant and excellent customer service – they know their stuff and are going to help you along the way! Not to mention, great bargain prices ! Try Siteground today! Previous PostPrevious Trendy Wedding Suite: Vintage Sunflower Theme!